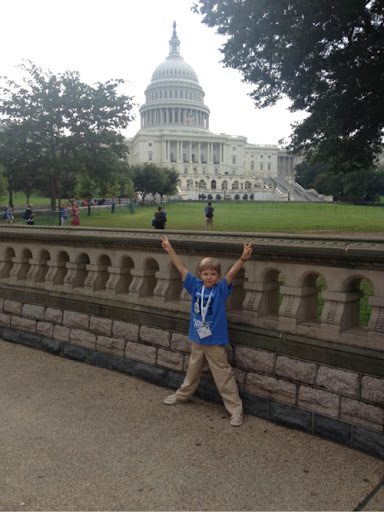 Rocco speaks on Capitol Hill for JDRf Children's Congress 2013! There have been times in my life when I was proud. Proud of myself, proud of my husband and proud of my kids. 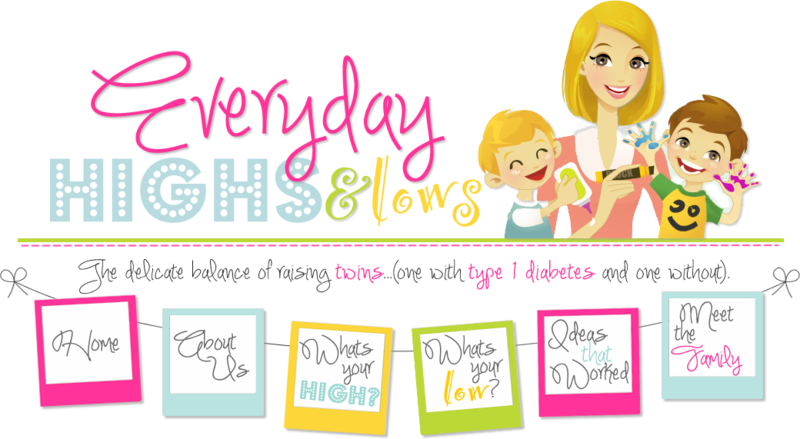 It is every mother's right and her duty to find moments that bring her heart that swelling feeling. Most of those times, it was when my guys have been brave. We have a term for it in our house, I tell the boys to "Find your brave!" "Finding your brave" means they have to push themselves past their comfort zones. Push themselves past their mental blocks of which they believe their abilities lie. It means to get that feeling in their belly that makes them angry for NOT doing the thing that scares them and to just do it already! Besides the concept that "Everyone has a story", this is the other concept I want the boys to carry with them (even when I am gone). It will help them sky dive, travel, ask for promotions and raises. It will help them get married, by an amazing sports car, or rock climb up the grand canyon. It could even help them make history! 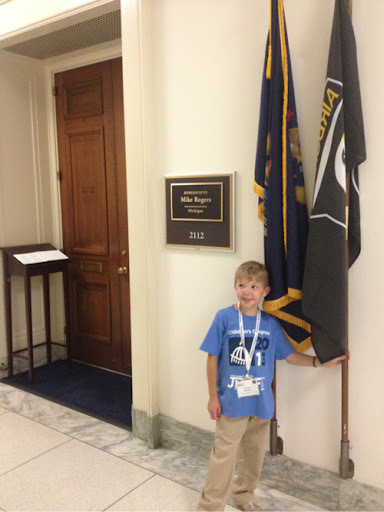 This week was a full week of Rocco "finding his brave!" 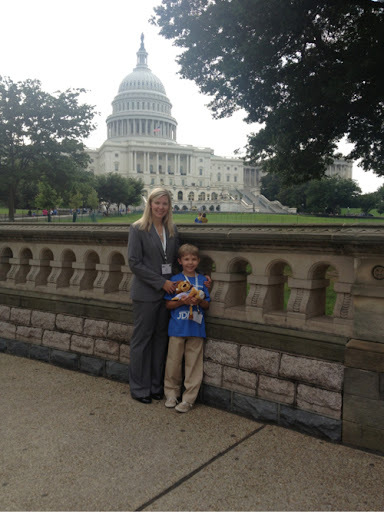 Before today, when we first applied to the Children's Congress, I was fearful. I wasn't sure that a seven-year-old boy was mature enough to handle the responsibility of speaking to adults about his disease. Much less represent the thousands in his state and country that shared his daily struggle. Especially to some of the most important people in the United States. 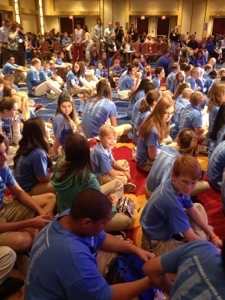 However, after watching the video on the Children's Congress 2011. I was compelled to try! What an amazing opportunity. 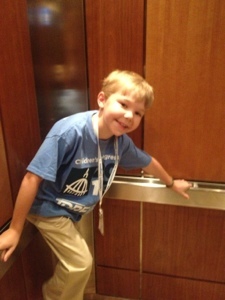 When I found out he got accepted to be a delegate for Children's Congress 2013, instantly I was thrilled. I mean dance-around-the-kitchen kind of thrilled. However, after the first, fun, five minutes - fear set in my belly. Could he do this? Should he do this? I knew I had to practice what I preached and "Find my brave!" So we carried on! 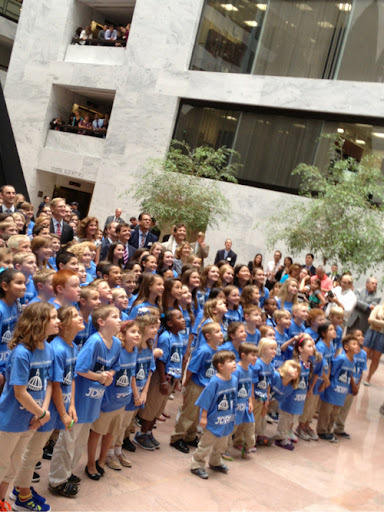 I learned as much as I could about the Congress, the economy and the task before JDRF - to urge lawmakers to renew the funding for the Special Diabetes Program. This program is on the cusp of so many advances for Type 1 diabetics. The artificial pancreas is one and islet encapsulation is another. Not to mention the technologies that are breaking ground to make Rocco and millions of other Type 1 Diabetics' lives easier every day. These technologies will let people with diabetes' bodies control their own blood sugar with sensors, insulin pumps, more advanced insulin, and auto-controlled blood sugar monitors. If the funding weren't renewed, these technologies will stop. I mean stop. 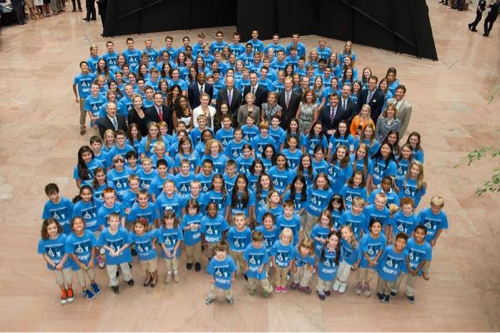 JDRF contributes $110 million to the program and the government contributes $150 million. The moms, dads, companies, grandparents, aunts and uncles are doing bake sales, walks, school fundraisers, and family fundraisers everyday to make up that $110 million but we are tapped out there. 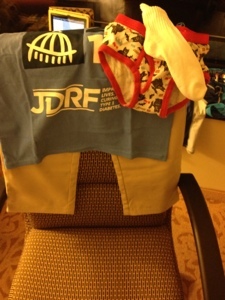 It would be impossible for JDRF volunteers to make up the other $150 million. Therefore the funding MUST continue. This is the only path to a cure and also to a better way of life. So, this was Rocco's job. 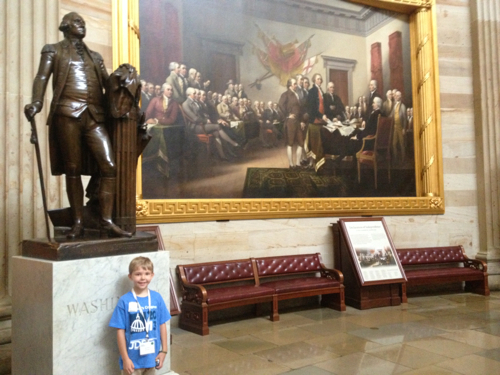 He was to visit two Senators and one Representative from his state. 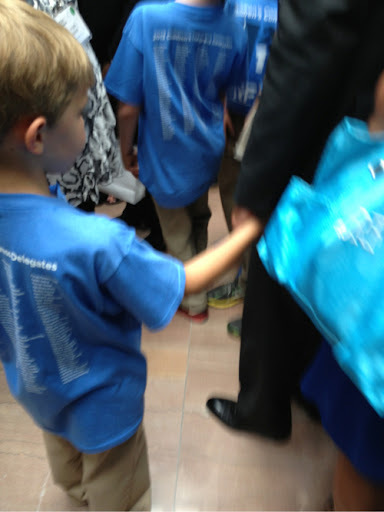 He would then, along with four, other fabulous, delegate children from our state urge lawmakers to show their support by signing a letter supporting the Special Diabetes Program. So, we woke up that morning and along with Mrs. Cynthia Ford from the Ford Motor Company stepped on a bus to make our appointments! Both Rocco and I were excited and nervous. On the bus! On our way! Rocco yelled to me, "Let's do this!" when I snapped this pic. We had a little while to wait before our first meeting so I thought I should check Rocco's blood sugar. Yikes! Normal is 100. Guess he is a little nervous! Blood sugar rises with stress. This just gave us the fuel for the fire we needed for the day. 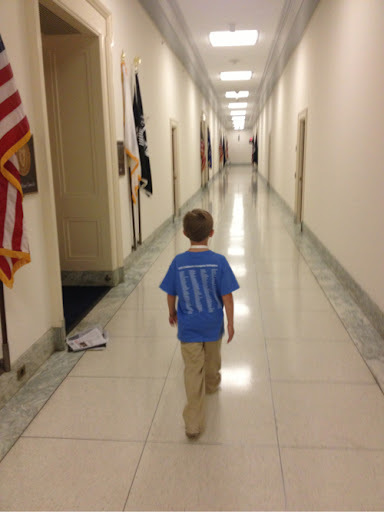 When it was time to meet our Representative, we started to walk the important hallways of the House of Representatives. 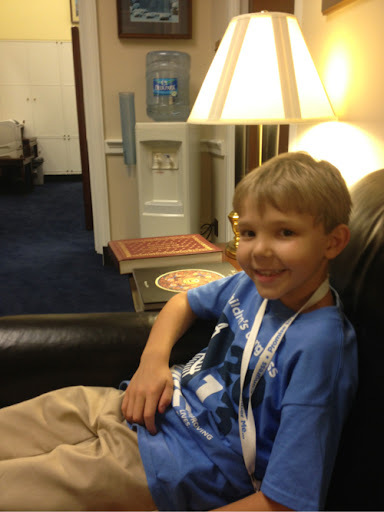 I laughed as I said, "Rocco, please put away your Minecraft so you can speak on Capitol Hill!" 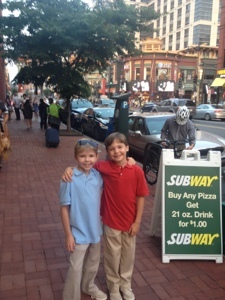 Not sure if it's just because he my kid, but in this picture, I saw it. 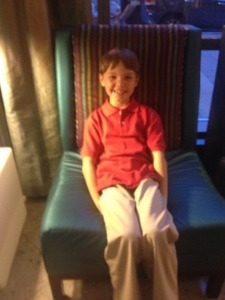 I flashed forward to a time when this little boy might be in a business suit and about another two feet taller. Walking down this important hallway to go and change the world -again! The confident way he held his shoulders walked ahead of me, as if he knew the way to go, made me proud! 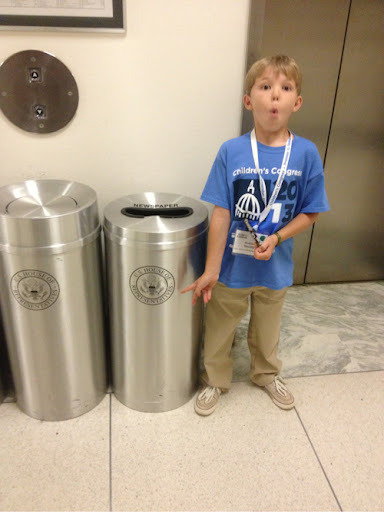 And then he turned back into the little boy again and was impressed that garbage can said House of Representatives. I breathed a sigh of relief that my little guy wasn't quite grown up yet and that I still has a little more time with him. 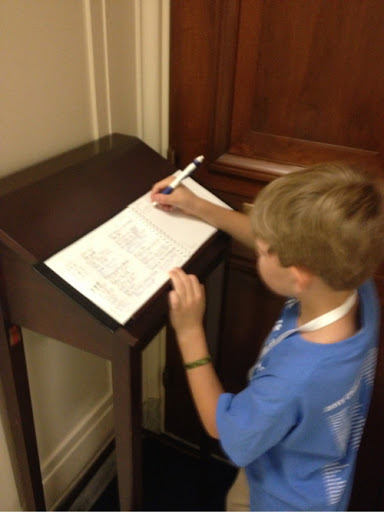 So cute to see him sign in to the Rep's visitor book. He wrote that was with JDRF but he made the J backwards. It looked so cute, I didn't correct it. 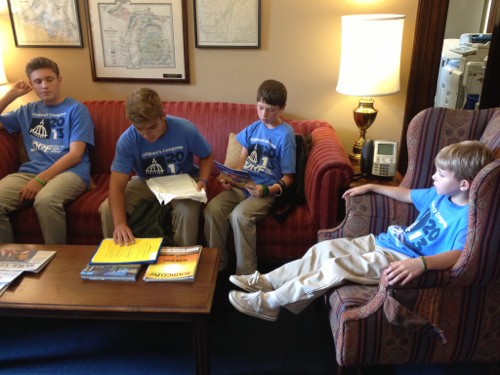 Waiting in the office while we waited to see if the Representative could see us. Then his aide came out and said the Representative was in Utah. They were "very sorry the Congressman wasn't here but Meghan would take the info and make sure he got it" Ugh! What a disappointment! Oh well, at least she was nice and not scary for Rocco. 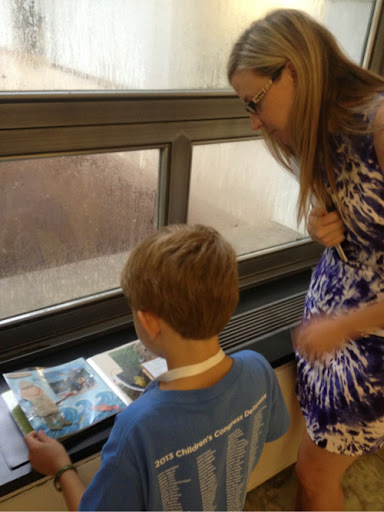 He showed her the scrapbook he explained what it was like to live with type 1 diabetes at seven years old and to please ask the Representative to support the Special Diabetes Program. 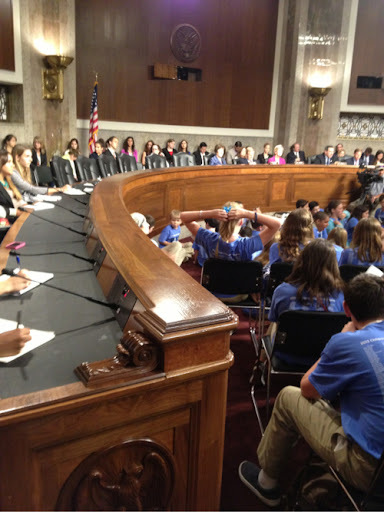 Next, we were on to gather with the four other people from our state and speak with our two Senators! I laughed at the fact that his feet didn't reach the ground. I thought of that quote that said "Reach for the stars but don't let your feet leave the ground!" 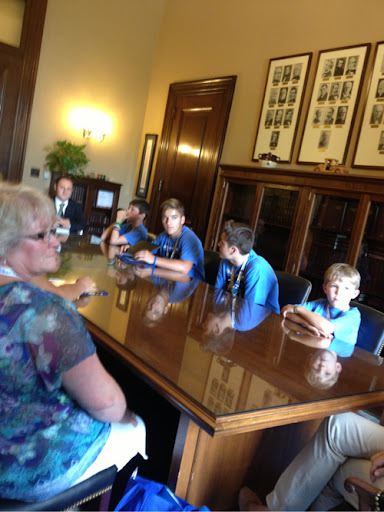 Senator Stabenow stepped out off the Senator floor to meet with us and listen to what the kids had to say. She was so nice and said she was fully in support of the SDP! One down, one to go! 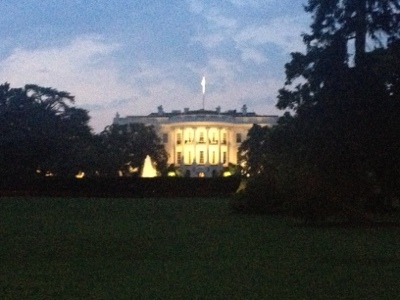 Rocco and I walked off for a little tour on our own for a minute before continuing on our important day. 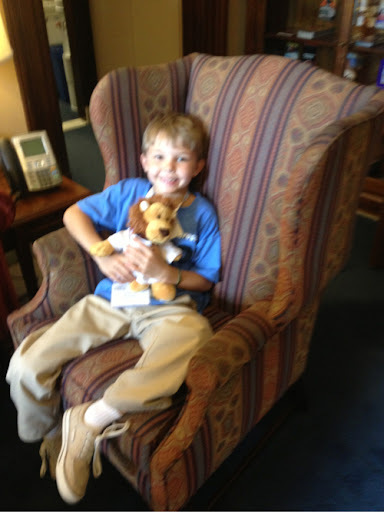 Photo op with Medtronic's Lenny the Lion while waiting in the Senator's office. This was my favorite part of the whole trip! Ok so at this point, Rocco had been "on" and "acting appropriately" for three days. He was getting tired. At a certain point, while we were discussing the issue of curing his disease to one of the most influential men in the US, he got up, walked over to me and said he was scared. He said he wanted to speak to the Senator but he didn't know the words to say. I looked down at my poor son who had tears in his eyes. I felt bad for taking him on this trip for the first time in three days. He had been so good and did everything he was instructed to do but everyone has a breaking point. This was his. I kissed him on the head and said not to worry, that I would be happy to tell his story when it was his turn. He whimpered a little and "No! I want to but tell me the words to say." 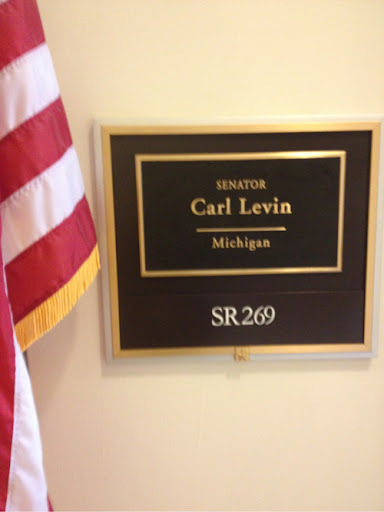 I whispered in his ear to tell the Senator his name, where he lived and how old he was when he was diagnosed. He said he was still scared but he wanted to try. It was nearing the end and he was still stuck to me like glue. When the other kids finished talking. 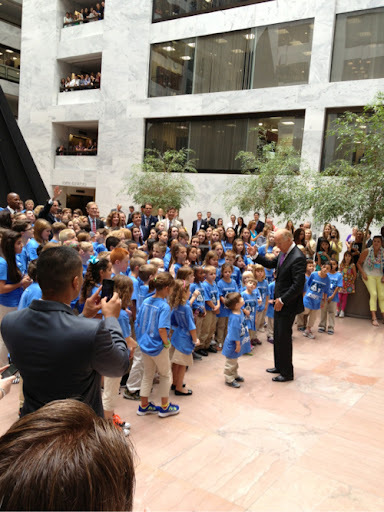 The Senator said, "Okay kids, thanks for coming by..." One of the other moms who didn't know he was crying and didn't want the Senator to forget about him said, "Rocco, don't you want to tell the Senator your story?" My brave boy quickly jumped back in his seat. The oldest boy of the group gave him the scrapbook that housed all of their pages/stories and whispered in his ear "Just read the words". Rocco dutifully started to read the words quietly. 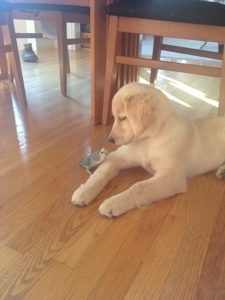 "my name is Rocco. 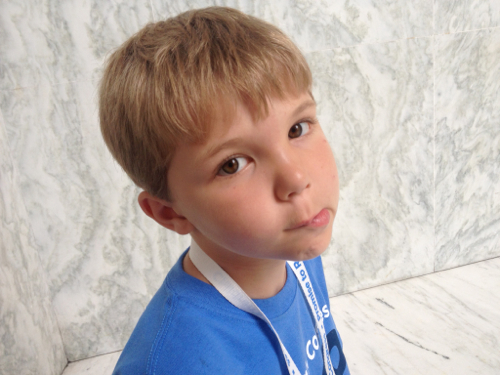 I am seven years..." Then the Senator interrupted him. "Sorry son, I can't hear you, what's your name?" Rocco took a quick deep breath pushed the book away, looked the Senator in the eye found his brave, and in a large voice said "My name is Rocco. I am seven years old, actually almost eight. Diabetes infects my life everyday. When I am outside and playing with my friends I always have to stop the game and go home to check my blood sugar. It takes too long so I want a cure for diabetes." If I wasn't afraid of embarrassing him, I would have stood up and put him on my shoulders and paraded him around the room! I was so incredibly proud of him that he "found his brave!" What a moment for me! What a more important moment for him! The Senator was great. He said, "Rocco are your friends nice to you when you have to go home to check your blood sugar?" Rocco nodded yes. Then the Senator said, "Ok Rocco but just so you know. I have the entire United States military at my disposal in case they are not!" The room exploded with laughter. I imagined getting up and kissing that old, important man hard right on the cheek! Instead I silently thanked him. Next, was the hearing. For me and all the other parents in the room this was a very big moment. It was funny because at one point, Rocco asked if he had to sit on the floor again. I laughed and said yes, knowing what was going to come next. "Ugh!" he complained. "Sitting on the floor makes my back hurt!" 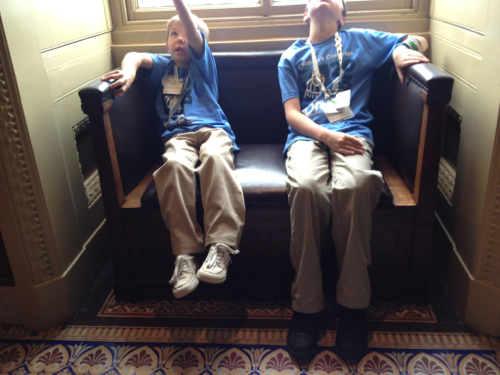 I jokingly replied, "Rocco, please do not complain about sitting on SENATE ROOM FLOOR!" Haha! That's him in kind of the center of the picture. I had learned a valuable lesson this week, each time he was in the crowd of children, it usually took at least an hour and half to accomplish the group's goal. Until now, there was no way to communicate with him when he was amoungst the other children to see if his blood sugar was falling low. During the song with the American Idol star and during the inspirational time with the celebrity role models, after about one hour every DMom in the room would get fidgety. We all were going too long without being able to check on our kids. I joked with one of the moms next to me however that I had never felt safer for Rocco than I did at this moment. 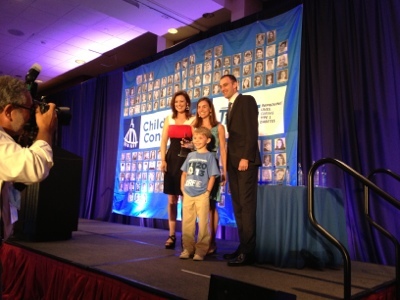 This moment where he was surrounded by 146 Dmoms! Every single one of them had site change stuff, extra sources of sugar, insulin, almonds, beef jerky, water, glucagon pens, etc... Talk about a powerful and prepared group of women! Plus, we Dmoms run as a pack. In the diabetic community, we all parent each others children. Surpringly, without judgement. Which admittedly is odd for a group of women. But we all know that raising a kid with diabetes is never perfect and is never really anyone's fault. So "united we sat" in that meeting. It was cute because if one of the kids did have to get up from the floor to get their blood sugar checked from their mom, you saw 75 moms turn their heads to read that mom's face. We collectively know the facial expressions of a high blood sugar and a low blood sugar. If one of the kids got in trouble with a scary low, every mom in the room, silently prayed, and sent helpful wishes to that child. Talk about protection. I have seen it before with my DMoms back home but it was once again a cool thing to see on a national level. It takes a village to raise a DKid! Anyway, so when I seperated from Rocco this time, I was prepared. I knew this meeting would last at least an hour and a half. It was a Senate hearing, after all. So I gave him tablets, his monitor, and his phone. He was instructed that if he got bored and cracked it open to even peek at Minecraft, I would take it away for a month. Then, I sat. 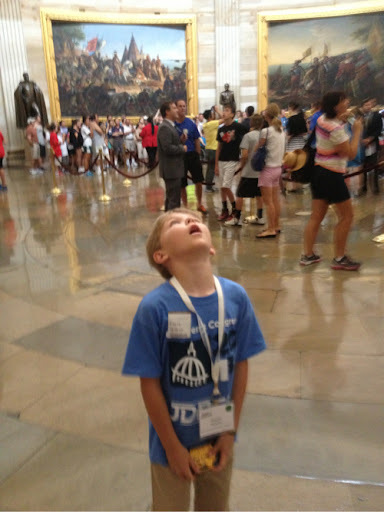 I was in awe at the amazing process of the government. I was impressed with the speakers and their compassionate words. Then, I got a text half way through. "How much longer will we be here?" Ha! I laughed. I sent him back "30 minutes." When we went to gather up the kids, I saw him shut his phone off and put it in his pocket. I led him out of the room. Truthfully, I was going to let it go but then Honest Abe piped up. "Mom, if you saw me on my phone. It was because Zeke called me. Then I answered it and said,"hello." Then, he said "hi." Then he hung up. Then I called dad back to see what Zeke wanted and dad's phone went to voicemail. So I hurried up and texted Zeke. "What did you want?" And then that's when you came up and saw me on my phone. I WAS NOT playing Minecraft! I swear!" I stared to laugh so hard that my laugh echoed the whole Senate hallway. 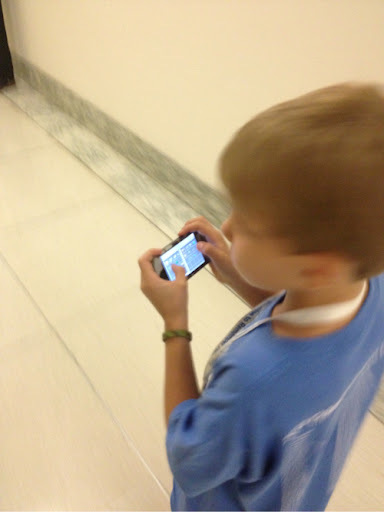 I thanked him for being honest and reminded myself to teach my son some cell phone etiquette. Then, I realized it was probably worthless to say, "Rocco next time you are on the Senate room floor, please don't take any calls from Zeke!" Haha! As of our day wasn't cool enough already, THIS happened! 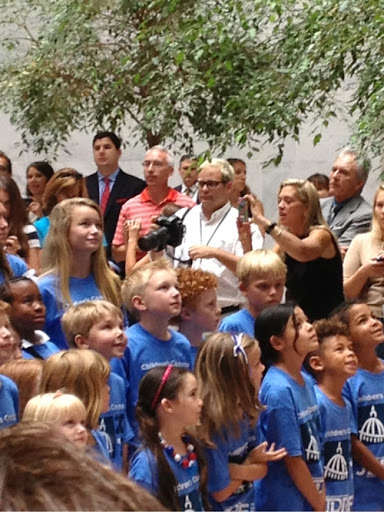 Okay, so they wanted all the kids together in one of the Senate buildings to take one last picture before everyone went home. They told us someone really special was coming and not to send it out on any social media channels because they didn't want a crowd. So everyone assembled like this and we waited. And waited. Then suddenly HE appeared! 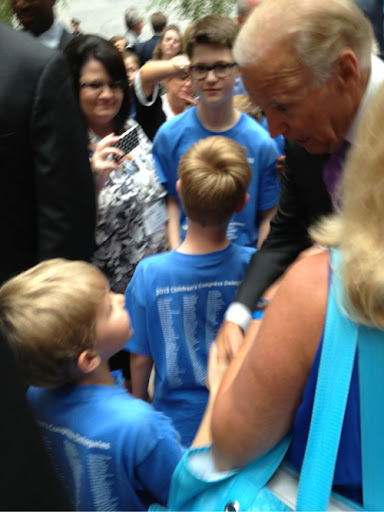 Now, I don't care what side of the fence you are on politically, when your son gets this close to the Vice President of the United States, it's pretty exciting! He was really nice and apologized for being so long but he was meeting with the President. Which was a funny excuse and got a laugh but then said "No really, I REALLY was meeting with the President! Everyone laughed. 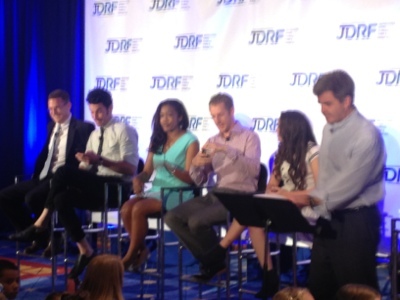 Then he said that one thing he does know about kids with diabetes is to leave them standing for a long time. 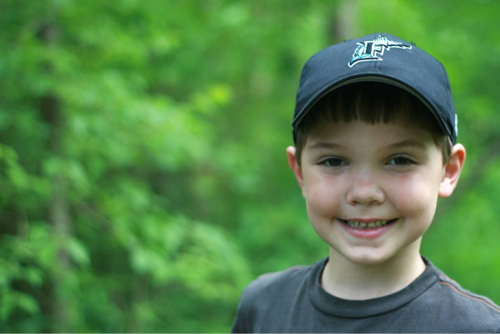 All the moms fell in love with him and melted, as he lived I our world for a split second and understood that standing for a long time can drop a blood sugar fast. It was great! They snapped this picture. Rocco is in the second row and the fourth kid in. Then it was time for the Vice President to leave. 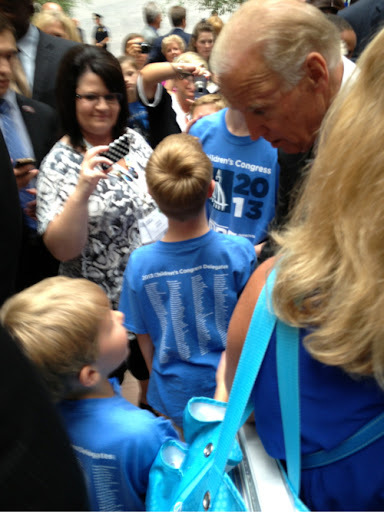 I told Rocco to "find his brave" one more time and stick out his hand and the VP might see it and shake it. Look at the way he kind of has it out but kind of scared. My brave boy! I was so proud of him because then this happened! VP: Hi Son, what's your name? VP: How old are you? VP: You are getting big son! Very big! Yep! 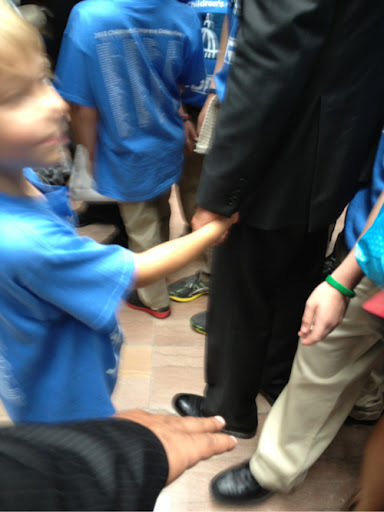 He held his hand for almost a minute! In my mind, I said to myself, "Man! 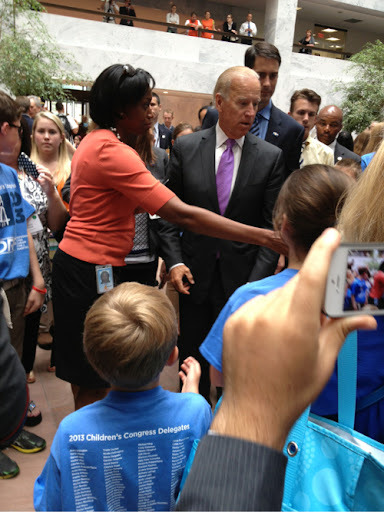 That VP sure is lucky to be holding my kid's hand!" I realized one day when Biden was in his old folks home he would see Rocco on TV and say, "Hey! I knew that kid when he was almost eight!" Well maybe not, but a girl can always dream... Because so far this girl's dreams keep coming true! 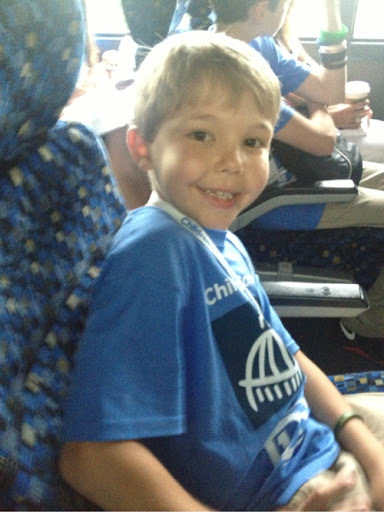 On the way home, we all thanked Rocco for helping us get to DC and experience so many cool things! He replied, "When you have diabetes you have to look for the perks!" So I haven't had a good Internet connection for two days! So I hope you don't mind me posting two days of fun in one day's post. First, let me start by saying the world is an amazing place. When you spend your days in a bubble that you call home, you can become sheltered by your own complacency and your own comfortability. Well my little guy sure has cracked open my shell and shown me a world I would have never knew, if he hadn't come along! Excuse me for name dropping in this post but if your anything like me, meeting or getting close to influential people gets me excited! So I will pretend you are all like me and name drop galore! Get dressed. This is the standard uniform of all the children. I considered it like their superhero costumes! I love that he did all of this important stuff while wearing character underwear. I kind of just reminded me that he is still only seven. I'm sleepy but I'm up and ready to go! 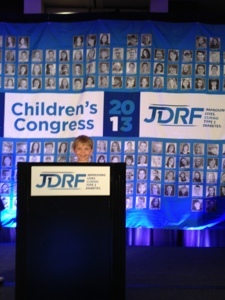 The first part of the day was sitting and listening to all of the people with diabetes who have done amazing things! 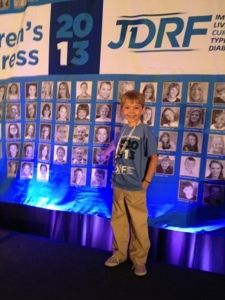 So inspirational for Rocco to see he can do and be anything with Type 1 Diabetes! ABC Family's Mary Mouser, Top Chef's Sam Talbot, Charlie Kimball the race car driver, NBC news Associate Producer Leslie Adkins, MLB's sportscaster Brian Kenny, & 10 Olympic Gold Medalist Gary Hall Jr. Phew! The power in the room was intense! 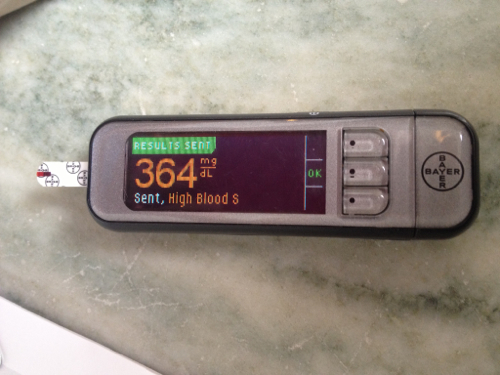 Checking blood sugars interrupts even really cool moments! Kind of the reason we're here though, I guess. Then, we were off to lunch! Rocco was asked to give an award to the Ford Motor Company for their tremendous efforts on being the largest fundraiser for JDRF of all-time! We were thrilled at such an honor! They told us we were at table 3. Which was in the front! Yikes! We sat next to the awesome Moira McCarthy Stanford who recently released her first book on raising teens with type 1 diabetes ( a much needed publication!) She was wonderful and warm! Then we sat next to the Ray Allen & his awesome wife Shannon who sits on the JDRF International Board of Directors. 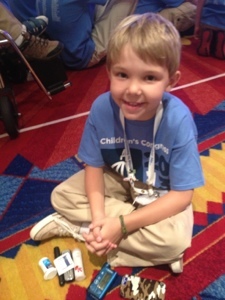 They have a little boy wit T1D who is simply adorable! Ray is a 10 time NBA All Star and probably the nicest man I have ever met! We also sat across from a wonderful woman named Elizabeth Brakebill who is the Community Relations Manager for the Ford Washington staff. She even offered us tickets to an IMAX movie in the city! Finally, we sat across from Mrs. Cynthia Ford! 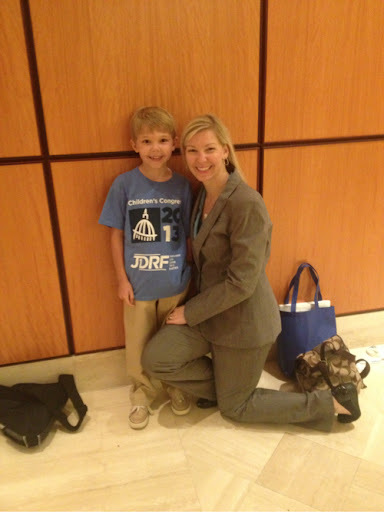 She is also on the JDRF's International Board of Directors and does such amazing work for and with JDRF! Okay, so THIS is where I got nervous! I mean, THE Mrs. Ford? Really?!?!? Let me tell you guys, she was AWESOME! So down to earth and so wonderfully great to both myself and especially Rocco! I mean WOW! What a lady! So then it was time to present the award! 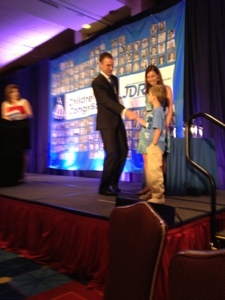 The President of JDRF said a few words and then shook Rocco's hand. Then, Rocco, Jeffery Brewer, Miss America 1999 and Elizabeth Brakebill from Ford snapped a picture! I was really so proud of him! 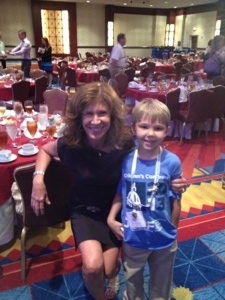 Mrs. Ford was so nice and snapped a picture with Rocco! 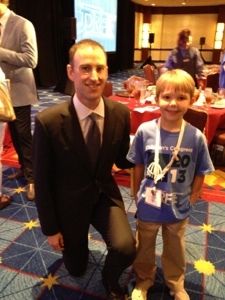 Then, Jeffery Brewer was nice too and snapped a picture! 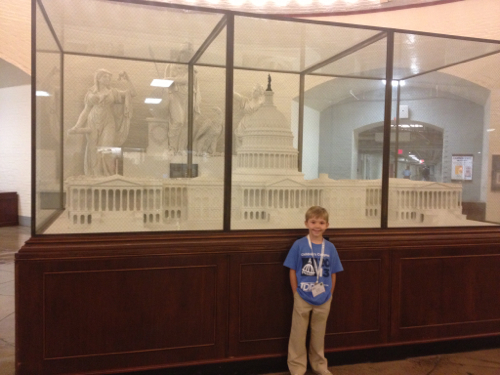 Flashback: One day when the boys were crawling around on the floor, I looked at Rocco and said to him as I picked him up, "One day, I am going to see you behind a podium!" Then I kissed him on his chubby cheek and carried on about my day. I have never forgotten that for some reason! 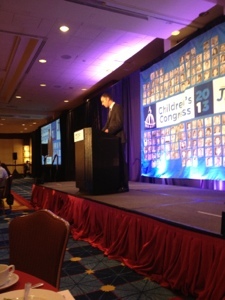 So after the luncheon was over, I told him to go up to the podium and take a picture! I was so happy to see my dream come true! 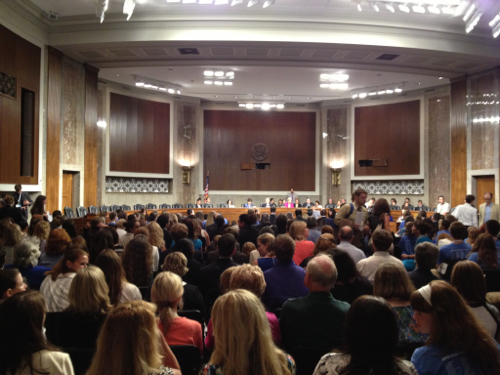 After lunch we went to a training session on how to speak with our two Senators and one Congressmen the next day. It was very scary because there was so much to know about how to handle these meetings and more importantly get to them! 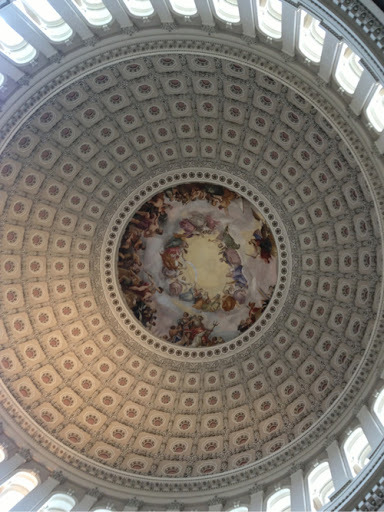 The Capitol Building is a big place! Oh well, better practice what I had been preaching to Rocco all day and "Find my Brave!" No going back now! 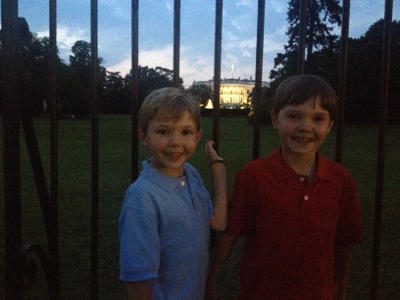 We went out to dinner with Zeke and Michael and saw the White House at night! So, when all was said and done we just had an amazing day!! !